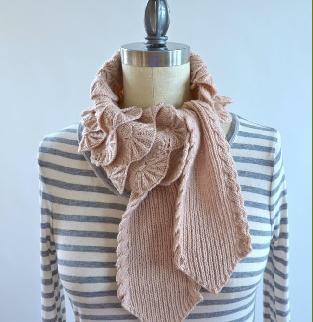 A fun, quick-knitting scarf with just enough ruffle, perfect for showing off super soft yarns and handspuns! This scarf is shaped with short rows and gently curves towards the ends. Perfect for wrapping around your neck with not too much bulk. Approx. 50" Worsted weight yarn. knitted vertically from the center out. A versatile shawl or wide scarf, beginning with an innovative garter stitch border cast on and shaped with short rows for a subtle curve for a very wearable shape. This pattern incorporates a fun lace and cable pattern. 58" along top edge, 11 1/2" deep at center. Worsted or DK yarn. Charted and written directions. Size 7 (4.5mm) 40" (or longer) circular needle.